Mark Galli (MDiv, Fuller Theological Seminary) is senior managing editor of Christianity Today. A former Presbyterian minister, he is the author, coauthor, or editor of several books, including Jesus Mean and Wild, The Complete Idiot's Guide to Prayer, Beyond Smells and Bells, and 131 Christians Everyone Should Know. Galli lives in Glen Ellyn, Illinois. 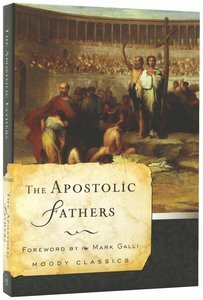 Customer Reviews For "The Apostolic Fathers (Moody Classic Series)"
A diverse collection of writings, the two most notable being 2 Clement which is real convicting and cleansing teaching and the Pastor of Hermas (also known as the Shepherd of Hermas) which is an exciting collection of visions, parables and teachings, and makes up about half of this volume. Hermas reminded me of "Journal Of The Unknown Prophet" a bit, which is something a bit more recent. The font is a good size and easy to read and the cover is soft to handle and the feel of it goes well with the painting on the front. I'd recommend this for those who like good Christian teaching from historical periods.